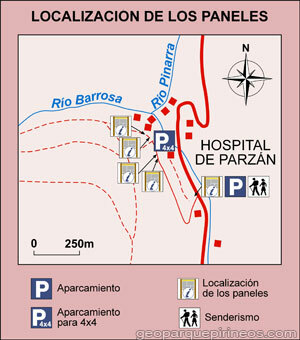 Mining heritage of Sobrarbe. Huistoric Geo-mining Trail. Out of respect and admiration for the generations of families that worked with the ephemeral wealth hidden in the mountains in the form of metals of economic interest (iron, silver, lead, zinc, etc. ), we intend to publicize the significance of abandoned mining activities, without forgetting their geological context.. The mining route at the entrance to the Barrosa Valley. In spite of how it may seem, these veins and seams were never especially rich in minerals. Mines were dug in mountainous areas with difficult access where they were covered by snow for several months of the year. Working conditions were always hard despite technical advances brought by the industrial revolution. The history of mining in the high valleys along the upper course of the Cinca River is crucial in understanding the history of northern Sobrarbe. The first contribution was to create a route north of Bielsa that could be walked in a few minutes. It has four information panels to help us go back in time to the beginning of the 20th C., during the peak of the Industrial Revolution, when the plunder of natural resources was considered a benefit to mankind. No doubt, this is a lesson we should learn for the future. Among the principle minerals that were exploited we find: fluorite, galena, pyrite and siderite. They have diverse uses. Fluorite is used for varnishes and fluoride production for dental hygiene. Silver from argentiferous galena can be used for jewellery and computer micro-circuits. Iron from siderite, sometimes associated with gold and copper, has several applications. The quality of iron from these valleys was acknowledged world-wide mainly as a consequence of the characteristic production process carried out in the Pyrenean valleys. Iron, silver and lead deposits were known previous to the Roman Empire. Mine works reached their heights during the 16th C. - Royal Mines in Parzán - and later, they began to decline until the 20th C. The last working mine was abandoned in the 1970's..
Technical development caused natural resources to be exhausted, though those resources were never abundant. Nevertheless, mine workings and infrastructures left an important mark on our landscape: blasting, dumps, excessive felling of trees, changes in the course of rivers, etc. Once these works were abandoned, the landscape recovered from its wounds. At the present time, some remains of those facilities still stand, good examples are the remains of hydraulic power stations and mineral transport by means of aerial cables.. The terrain on the French side of the Pyrenees is less rugged than on the Spanish side. Therefore, before the building of the international road along the Cinca River (opened in 1976) communication with France was easiest. At the beginning of the 20th C., the managers of the mines decided to process the minerals in France. 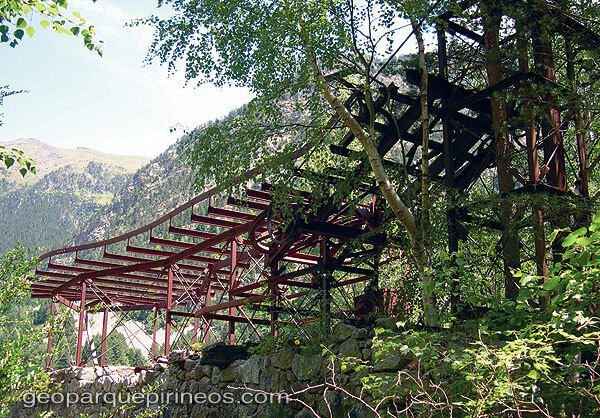 Thanks to the latest technology and a huge effort, the aerial cable known as "el Transpirenaico" was built in order to transport small wagons laden with galena from Hospital de Parzán (which no longer exists) to "Pont de Moudang", crossing the border at 2464m above sea level, along a route longer than 10Km. The remains of those installations, entirely built with local iron, are the only traces of the mechanical devices from the most optimistic period of the Industrial Revolution - the "last iron age" - when it was believed that everything needed by society could be built from iron. No doubt, it was a naive belief, but the quality of the iron from these mines was indisputable. We just have to look at how these installations endure year after year without rusting, without protection, exposed to the high mountain weather of the Pyrenees. . Evidence of our mining heritage. Lower station of the Luisa aerial cable.. The design and the structure of the galleries show the technicians' skill in using the orographic features for ventilation and drainage, as well as showing us the difficulties of that work. Until pneumatic drills were used, excavation processes were slow, carried out with drop hammers hitting metal bars in the mine. Men and animals pushed the small wagons laden with minerals, until aerial cable transport dramatically changed work efficiency, with the technology still used in current cable cars..